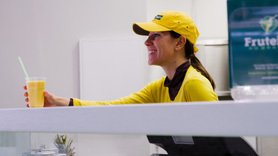 Nectarvis srl - Fruteiro do Brasil offers a modular franchise module that allows the Franchisee to benefit from the growing global attention to healthy and natural eating. 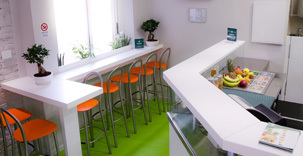 Indeed, more and more Juice Bars are opened everywhere on the basis of greater attention to the wellness and increasing appreciation for many preparations with tropical fruit, which have now became an healthy choice for increasingly large segments of the public. Fruteiro do Brasil, as the only integrated producer of fruit pulp Brazilian, is able to offer to the Franchisees a program structured in modules with different levels of investment and operational complexity. 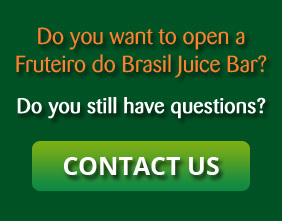 What products do you sell in a Fruteiro Juice Bar? The typical preparations of Fruteiro do Brasil are simple and practical, as you can see in the videos about Fruteiro's fresh smoothies and Açai na Tigela. In addition to very popular tropical varieties such as mango, pineapple, papaya and passion fruit, Fruteiro do Brasil's assortment includes less known varieties that are experiencing a growing in popularity due to their excellent nutritional properties. Fruteiro also provides its two lines of packaged products made of tropical fruits: sorbets on the stick, made only with fruit pulps, water and sugar. These ready-to-eat products allow the Franchisee to ease the operations of the outlet and can be an additional source of revenue from takeaway sales. Other preparations may be added to this range which characterizes the brand Fruteiro to complement the offering of the franchised store, upon agreement between Fruteiro and the Franchisee. The investment required is obviously very variable depending on the module chosen and starts at about 25.000 Euros. Fruteiro do Brasil can provide for all modules the equipment and technical furniture, ensuring the best conditions for effective operations and an excellent quality / price ratio. 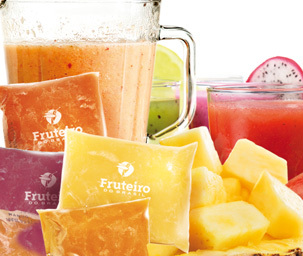 Fruteiro's selection not only helps the Franchisee to characterize and differentiate his outlet from competition, but also ensures attractive margins: all preparations with frozen fruit pulps and our packaged products ensure to the Affiliate gross margins of at least 70% of the pre-VAT turnover. What other advantages does Fruteiro offer? to provide a continuous supply of know-how resulting in (non-binding) proposals for future new recipes and sharing new recipes and promotional material.